Preheat oven to 400. In a bowl toss green beans, mushrooms, thyme, lemon juice, olive oil, salt & pepper until everything is coated. 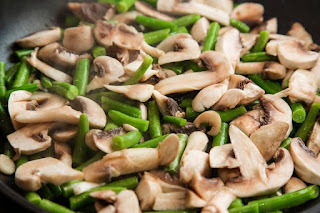 Place green bean mushroom mixture onto a baking sheet in a single layer. Bake for 20 minutes. Remove from oven, place in serving dish and sprinkle with Parmesan cheese.